Episode 5: Talking, Walking Supply! Posted byffadmin	 May 10, 2017 September 5, 2017 Leave a comment on Episode 5: Talking, Walking Supply! The lads talk about launching a new YouTube series “Filmmaker Flashcards”, start discussing their TV Show concept “5 Alarm”, have their first phone interview with the incredible “James McDougall” from “Love at First Stab”, and “Walking Supply”. The show wraps up by getting back into the new film journey segment “Son of a Pitch!”. Starting at some point in the next week or two, we are excited to have a new YouTube Series in conjunction with the podcast so that when you Subscribe to our YouTube Channel or follow along on Facebook and Twitter, you can always count on new content from the Fable Forest on Wednesdays!! “Filmmaker Flashcards”! The lads meet their Twitter growth goals for the year! 5 Alarm television show concept, locations breakdown. If you want to download the script for our pilot episode of “5 Alarm” our firehall comedy show and read about the show and characters in general. CLICK HERE! The BlackList – In 2005 Franklin Leonard surveyed almost 100 film industry development executives about their favorite scripts from that year that had not been made as feature films. Since then the voter pool has grown to 500 film executives! Over 300 Black List screenplays have been made as feature films. Those films have earned over $26 billion in worldwide box office, have been nominated for 264 Academy Awards, and have won 48, including Best Pictures SLUMDOG MILLIONAIRE, THE KING’S SPEECH, ARGO and SPOTLIGHT, and ten of the last twenty screenwriting Oscars. 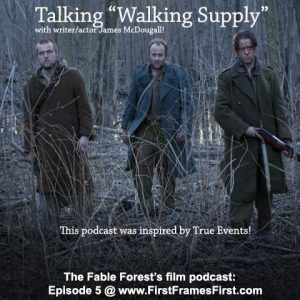 When talking to James McDougall about his latest short film “Walking Supply”, the guys reminisce about their Cinecoup days! (More to come on this someday!) and we NEED to show you the Love At First Stab videos we were in love with! The hilarious entry when they had to tell more of the story without speaking!Oh those dance moves! NEW SHOW SEGMENT – SON OF A PITCH! The guys continue on discussing their new segment where they work a project all the way from concept, through brainstorming, script writing, Pre, Prod, Post, distribution, etc. In this episode… they pitch a few more ideas! What are the new pitches for this week? Adrian’s = “Couples” or “ILLegal Guardians” (Ha! J’s title for Adrian’s flick that Adrian hates!) Jason’s = “Jimmy’s Rug”. Listen in to hear all about them! Episode 4: Son of a Pitch!